Ever Get Comments About Your Child’s School Lunches? My kids bring lunch to school pretty much every day. I’m good at making their lunches on a small budget, and it allows me to include fresh vegetable and healthier ingredients in their lunches. What amazes me are that the kids get comments on their lunches, not too much from the other kids, but from the adults around them at the school. My oldest says that her lunches fascinate one of the yard duties. My daughter often takes leftovers from the night before, plus a carrot or other fresh vegetable. It doesn’t often much resemble what other kids bring, from the little I’ve seen. No bag of chips, no juice box. It’s not always perfectly healthy or balanced, but it averages pretty good. My daughter eagerly awaits the next batch of homemade chicken soup so she can start bringing it to school, as it’s a favorite. My son doesn’t get nearly so many comments, mostly because he’s in a big peanut butter and jelly phase. That’s all he ever wants for lunch. It’s cheap, and I’m glad of the protein in the peanut butter, but it’s not my favorite lunch for him overall. But when you pack school lunches, you want to be sure that the food will be eaten, and that’s what works right now. I hope it changes soon. The key to a good packed school lunch is to make one that your kids will eat and not overmuch miss the junk that their friends will probably bring along. It pays to listen to what your kids want. Provide favored healthy foods, and they aren’t as likely to trade them away. I don’t do all the packing for my kids’ lunches, and I think that’s a part of what helps. I pack the main dish, they pick sides and snacks from what we’ve agreed is allowed. This keeps it healthy yet it was their decision in part, rather than entirely my own. Certainly they sometimes miss the foods they see other kids bringing, but not too badly so far. They know chips and such as an occasional treat, not a daily food. I’m hoping this will help with lifelong eating habits, although one can never be certain of that. Still, this is the time to try. It’s really a lot of fun packing school lunches that are healthy enough to get positive and intrigued comments from others. It’s a little way for my kids to stand out in a positive way. My daughter has started a new problem with the lunches I pack for each day. She barely touches them. Apparently she’s afraid people will laugh at what she brings. Here’s the thing, though. No one has. She has decided on her own that the foods I pack will be laughed at. You see, she’s the only kid, or so she says, who gets fresh vegetables in her lunch. Old favorites are going ignored. She wouldn’t touch her pasta salad, even though I threw black olives in to attract her attention. All she wants to bring is the canned soups and such I give her if I’m out of time to make something healthy. And I’ve long been resigned to the fact that this girl who loves my homemade bread will never, ever eat a sandwich. Not even at home, so at least that’s consistent. The one relief for this year is that she appears to be inventing the peer pressure. She admits to being worried about what the other kids will think of what she’s eating, but also admits that no one has ever said a word to her about it. I ask her about what the other kids are eating, and she rarely knows. Except for the day a classmate shared fruit snacks with my daughter because my daughter spilled her snack. This is a tricky situation, but I am determined to use it as a lesson in ignoring peer pressure. Better now when the problem is a matter of her perception, rather than actual teasing, I hope. I’m determined to find healthy foods that she will eat at school. Sure it’s easy to give in and feed her the canned stuff, but ugh! I don’t like to. I want to keep her eating habits healthy, not lazy. I’m going to have to experiment on her at home and figure out what she will eat. If it’s a big enough favorite I know she will eat it despite what her friends say. She did the day her friend told her that her pesto chicken looked gross, after all. She loves pesto chicken well enough to not care what others think. At this age, I figure not giving up is the key. She just won’t take to rational arguments such as “you love it at home” or “if no one has said anything, it’s not a problem.” Six year olds aren’t always the most rational of creatures, after all. But you can wear down their resistance and show them ways to cope with their problems. Hopefully I can get it to take before the next problem comes up. 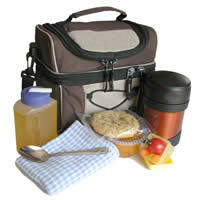 Do your kids face peer pressure in bringing lunch to school? How do you cope?